Connecting unconnected elderly people. Helping caregivers and organisations to provide the best service and reach a broader client base. We believe that everybody should benefit from video calling, email, web search and others. For the majority of elderly people, due to the current complexity of both the computer and the Internet, that is not possible. SeeYouLink changes that. From the point of view of the older adult, even those who never used a computer before, have low vision or mild dementia, SeeYouLink is as simple as flicking on a light and touching the screen. As part of the rollout in their community, HealthStrong Internet-enabled 91 year old woman living in remote location in rural Australia who never used a computer before. They set her up with touch screen laptop and 3G mobile connection. Currently, SeeYouLink is available only by invitation and in professional facilities. If you are a home user interested in SeeYouLink, please leave your email address and we'll notify you when it's available. If you are a professional in the field of aging, organization or business interested in SeeYouLink, please select “I’m a professional” bellow, leave your email and we will contact you within one business day. 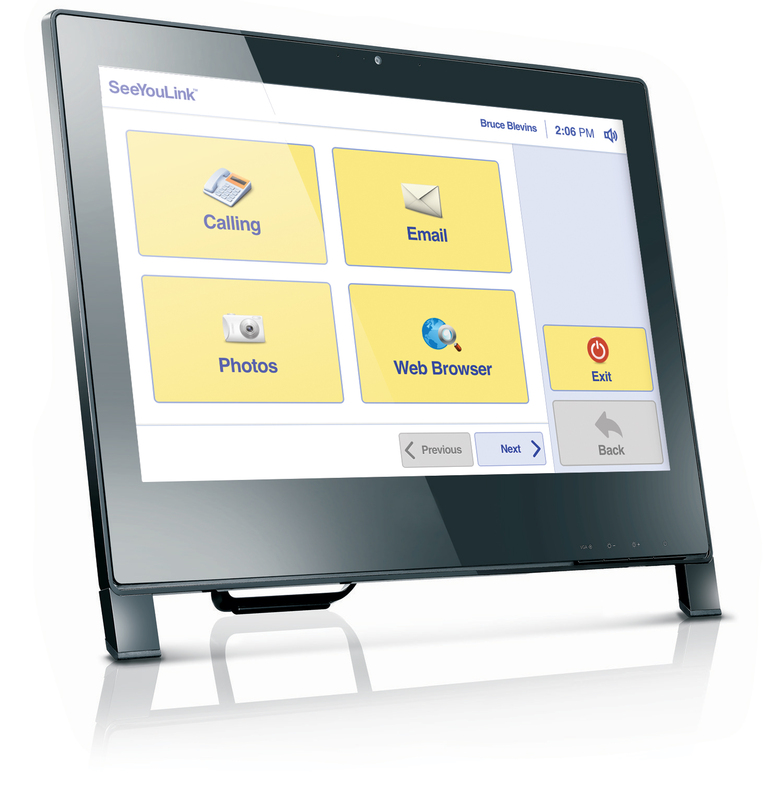 SeeYouLink enables face-to-face video communication with friends and family. The user touches a picture of a familiar face on the screen and in a moment they see each other and talk. Our email is made easier to use and provides features to enhance your experience. Features like, adujsting the size of the text, having the email read to you as well as the option of recording a voice message rather than typing a response. All the photos that the user receives through email can be easily saved to photo albums and viewed later. They can even be used as a screensaver and effectively turn their computer into a digital picture frame when not being used. The ability to see friendly and familiar faces daily has been proven to have positive effects to Alzheimer patients. Access to home videos shared on YouTube. By using Twitter in SeeYouLink, your loved one can be connected to the latest events whether it is from a grandchild or a movie star. No Twitter account is necessary. With a click or a touch, SeeYouLink users stay informed with the latest world, national and local headlines, sports, health, entertainment news and more. SeeYouLink users stay up to date with the weather at their locale, or at the locale of their family and friends; and can always be weather prepared when traveling. We have simplified browsing experience and made it safe by eliminating annoying popup messages and disabling prompts for malware installation. User can automatically be reminded about events, birthdays, even medication schedules and doctors visits. SeeYouLink comes loaded with games that are fun and competitive which help to keep them active and alert. Some of our games include Solitaire, word games as well as multiplayer Chess which allows you to play Chess with a friend while having a video call. With the touch of the button, they can signal that they are active and ok.
SeeYouLink has partnered with Happy Neuron to offer a professional suite of programs in cognitive fitness. You can invite family members to join in on the consultations with their loved ones to see and hear the advice given by professionals.